Hello all. Since I just signed up, I wanted to make sure this is the spot to post information on my solar collector project that I just completed. Welcome to our community. This is the right spot for your posts. So I built a collector into the wall of my shop. Due to the local regulations where I live, I can not do a roof or yard mount. For this reason I built it into the wall like a window to skirt the rules. I will go more in depth once I know my posts are working and the pictures will be sized right. Looks good from my end. Gordy is the one who prompted me to post my build on this site. So I wanted to build a collector to add a little heat to my shop during the day when I was at work. When I'm there I use a 100,000 BTU wood fired furnace. However throughout the night and the following day it can get cold and I don't want my materials to freeze. After much time reading about builds on this site and considering my options, I opted for the 4x8 built in you see above. Many photos and descriptions will follow. This is the box built out of 2x6 lumber screwed to 1/2" plywood. There is 1" polyiso insulation on the sides and back. All seems were sealed with black silicone. What are the reasons they wouldn't allow a roof or yard mount? It is zoning laws that prevent it. 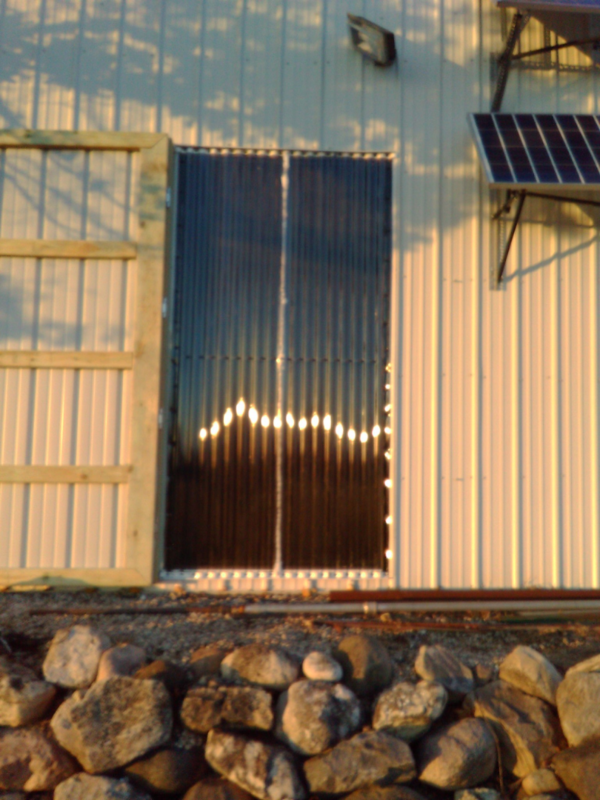 Basically anything solar must be attached to a building wall or roof and can not extend more than 18" from the surface. My roof slope is east/west so that's out. If you check out my PV panels in the photo, this is the maximum anything can be mounted away from the wall. I also have a ton of wind at my property. Anything built onto the wall needs to be super stiff and weather resistant. That is why I decided to make it part of the wall. There are crazy zoning restrictions on wind power as well. I built a turbine and it functioned well. The county building inspector made me take it down. The required height, distances from buildings, and distances from lot lines made it impossible for me to make it legal. I just returned from Canada where I saw a standard panel garage door where the panels inserts sections made of flexible plastic sheets. It let the sun shine in when the door was closed. A perfect collector yet still functional. I did not get a picture of them but they are located on the front of the Caribou Lodge in Banff CA. The skiing was great too. Keep in mind that when a statute or law is written for solar, it is almost always written for solar PV. Solar heat panels are something most cities don't have much experience with. Look very closely at the text as it is written, or post the restriction here and let us take a look at it. For example, there are lots of restrictions here in Minneapolis regarding PV panels, but they simply do not apply to any solar heater I have built. Temporary, or seasonal mounted heaters like I have, aren't much different from putting up outdoor seasonal lights. In fact, my solar heater longer uses a snap switch, so there is no electricity running outside where an electrical code issue may have been in play. The fact is most city ordinances and codes are written to have a bit of control when someone does something utterly stupid. City permits are to not only make money, but to hold people accountable. I just returned from Canada where I saw a standard panel garage door where the panels inserts sections made of plastic sheets. It let the sun shine in when the door was closed. A perfect collector yet still functional. Any chance you took a photo?